Atlanta is the capital of the South. We’ve got a restaurant in the center of town called Empire State South for good reason. That Damn Yankee Sherman declared victory in the Civil War after he burned Atlanta. But our fair city rose from the ashes to host the Olympics only a hundred years later. Here’s a brief history lesson on the Awesome ATL. 1822: the first English settlers arrived in what is now Metro-Atlanta. 1823: Decatur was he first town founded in our city limits. 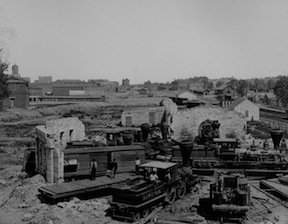 1836: the Georgia General Assembly voted to build the Western and Atlantic Railroad in order to provide a link between the port of Savannah and the Midwest. An engineer surveyed possible routes and drove his stake, the “zero milepost” into what is now Five Points. 1837: Terminus springs up around this area. It was briefly named “Thrasherville” for John Thrasher who built homes and the general store. 1847: Atlanta is incorporated as a town! Another railroad is added connecting the city to LaGrange in south Georgia and the city starts to boom. 1860: Atlanta has almost 10,000 residents and becomes the hub for all commercial, economic and social activity in the South. 1864: that Damn Yankee General Sherman marches on Atlanta and burns it to the ground. Georgia’s capital was less than 30 years old. Sherman continues his reign of terror burning everything on the way to Savannah, pilaging the South, and cripling a culture. 1871: President Ulysses S. Grant’s Congress passes the Force Bill suspending the writ of habeus corpus. Klan activities withered but racial tensions still run high. 1888: with the “New South” focused on a modern economy, instead of plantation farming, Georgia Tech opens its doors for classes. 1906: 27 people died and 70 more are injured in the Atlanta Race Riot (a result of the media-fueled hysteria over alleged sexual assaults on white women by black men). Most of the claims turned out to be false. 1917: 50 years after Sherman had burnt everything, the Great Atlanta Fire destroyed the entire city. More than 10,000 people are homeless. Amazingly only one person died: a woman who had a fatal heart attack after seeing her home burnt to a crisp. 1936: Margaret Mitchell (a modest newspaper woman) publishes “Gone With the Wind” and wins a Pulitzer prize in 1937. The New York Post calls it “A Fine Panorama of the Civil War Period” and it becomes to quintessential work on the Southern Renaissance. 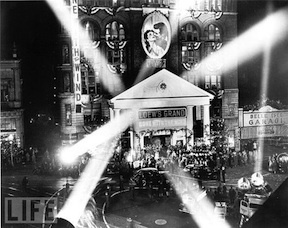 The Premiere of "Gone With the Wind"
1939: Atlanta hosts the premiere of “Gone With the Wind” at the Georgian Terrace hotel. It was a three-day party throughout the South. Governor Eurith D. Rivers declared premiere day, Dec. 15, 1939, a state holiday. The film received 10 Academy Awards and (based on inflation adjustments) Gone With the Wind is the highest grossing film of all time at $2.9 billion worldwide. 1941: World War II brings an industrial boom to Atlanta with airplane production, plus growth in railroad traffic shipping wartime commodities. 1942: The Center for Disease Control is founded in Atlanta. The 1940s and 50s saw the flight of citizens to surrounding metropolitan areas thanks to the construction of the highways. 1961: Atlanta becomes the epicenter of the Civil Rights movement thanks to the bravery of Dr. Martin Luther King, Ralph David Abernathy, and the heroic students of the historically black colleges. Mayor Ivan Allen Jr. supported the desegregation of Atlanta’s schools. 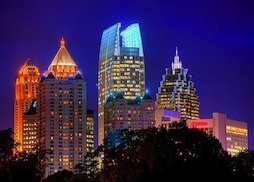 Throughout the 60s and 70s businesses promote Atlanta as “the city too busy to hate”. 1990: Atlanta is selected as the host city for the 1996 Olympic Games and begins major projects on parks, transportation infrastructure, and the sports facility now home to the Atlanta Braves. 1996: the Olympic positivity was thwarted by the bombing in Centennial Olympic Park killing two people and injuring 111. This violence, on top of other inefficiencies, leads IOC President Juan Antonio Samaranch to call our games “most exceptional” in his closing speech when at previous Olympics he closed in saying those games were “the best ever.” He resumed saying this at the closing of Sydney’s Olympic Games in 2000. Present Day: Atlanta is a cultural epicenter of the South, drawing thousands of visitors each year and millions of travelers through the world’s largest airport, Hartsfield-Jackson. Restaurants, art galleries, and new neighborhoods pop up every day. If you’ve got a great story idea about our fair Southern city, please comment below!